Who else was excited when these beauties were launched? 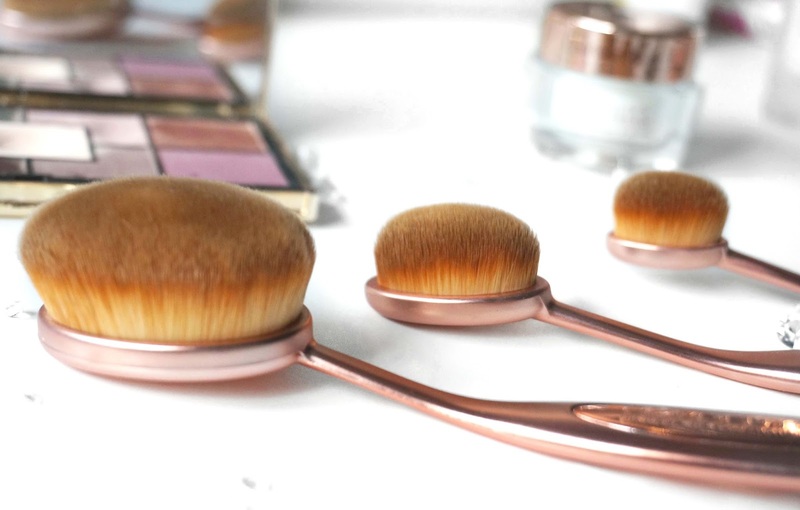 The Makeup Revolution Contouring Precision Oval Makeup Brush Set. Every brand out there is trying to create the next best dupe of the Artis Brushes which costs a minimum of £28. We all know what Makeup Revolution creates fantastic dupes for all our favourite products like the Too Faced Chocolate Bar Eye Palette with their I Heart Chocolate Palette. These Oval Brush Set costs £19.99 and contains Oval Face, Oval Cheek and Oval Shape. 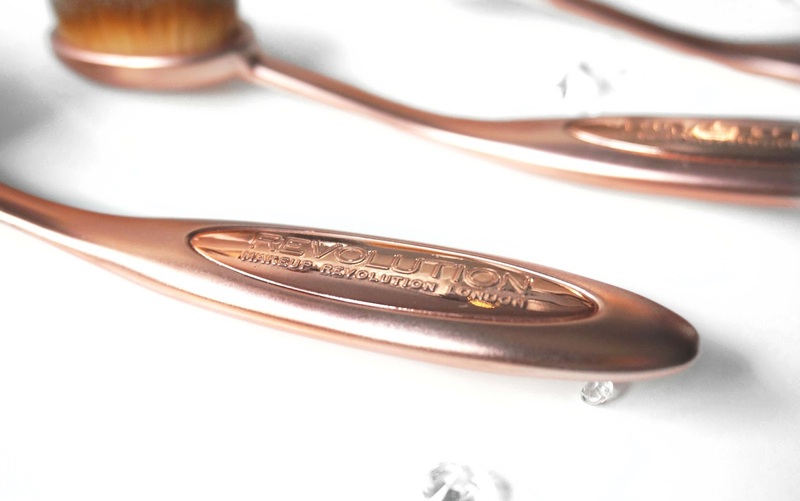 The handle is a beautiful rose gold colour - very Instagram-worthy and fits in your hand nicely with its curved edges and is all the same width and size of every brush. The head where the synthetic fibres are densely packed feels more weighted, therefore a little unbalanced and has a dome overall shape. It truly does look like a toothbrush and has a two toned effect on the bristles. I personally use the Oval Face for foundation only, once you dip this into a liquid product you tend to avoid applying powder with the same brush. 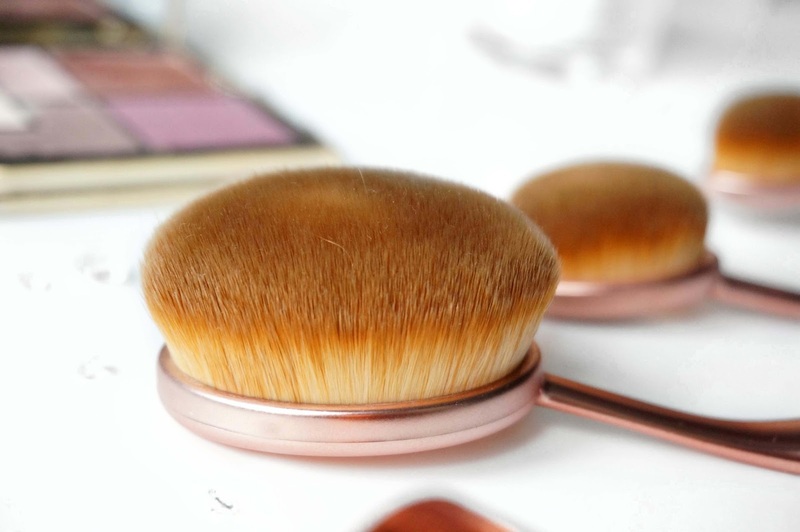 I definitely think you need to get used to the brush since it feels a bit alien at first, but once you master the circular movement you will get used to it.When I use the brush, I apply my foundation directly to my skin as this gives it the best coverage possible. This is indeed one of the fastest applicators I've used. There are many amazing reviews that this brush applies your foundation seamlessly but I find it a bit streaky especially on my cheeks. When I look closely at the bristles, I can see that I have more than a couple of stray hairs so maybe if I trim them the brush will perform better. Onto the second and third brush. The Oval Cheek - I'm not much of a cream contour person but when I did experiment with cream products I found it to be a bit uneven. I also found that using this brush to apply my powder bronzer disturbs my base, which is not what anyone wants. Maybe this brush overall does not like me. The Oval Shape is for concealer, highlighting and shading and I find that this one really tugs at my skin especially around my delicate eye area when I use concealer and all I can think about is my fine lines hating me. When I use this to apply my highlight it works wonderfully but it is a bit too big for the nose bridge area and the brush picks up a lot of product, so be aware. Overall I really like the idea of an oval brush but there are hit and misses. I like the Oval Face for foundation and it is definitely efficient in terms of time and coverage but it does look streaky on me. 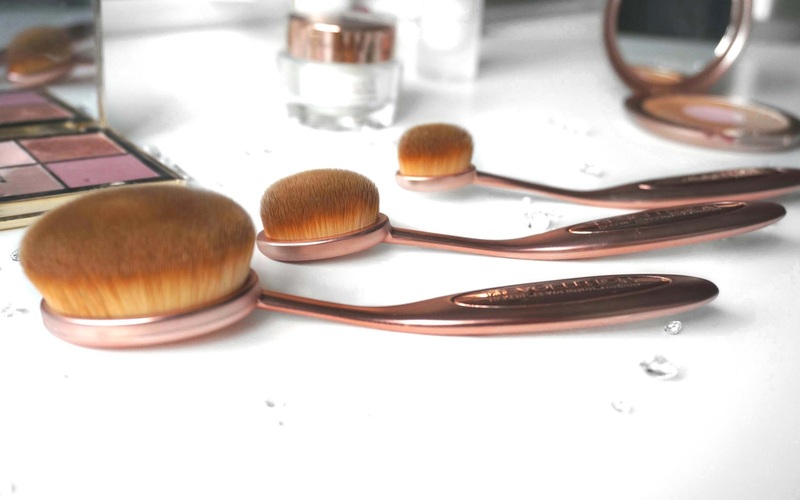 I will, however, be continuing using the Oval Face brush especially on lazy no makeup days. The Oval Cheek does not agree with my completely so I don't think I will be using it in the future but it's definitely a pretty prop to have. I like the Oval Shape as a powder highlight too but it can be a bit too strong so dip your brush gently into the product - one dab is probably enough and definitely avoid your undereye area for concealer. Would I recommend it? If you are dying to try out these oval brushes without breaking the bank I do recommend it and if there is a set of 2 or more brushes you like, get the sets since it becomes more affordable. If you don't need a set stick with the individual that they sell separately. Everyone has different opinions and different skin types so maybe it is perfect for you. If you have used these brushes let me know how you got on with them! I totally agree! I was desparate to get my hands on these and once I did I had pretty much the same thoughts. They're not as great as I wanted, unfortunately. :( xoxo.